If you follow me on Instagram (or Twitter), then you saw that I’ve been in Houston for the last few days. I haven’t been back since we moved last year, so it was great to get back into town, visit friends, restaurants and lots of favorites. 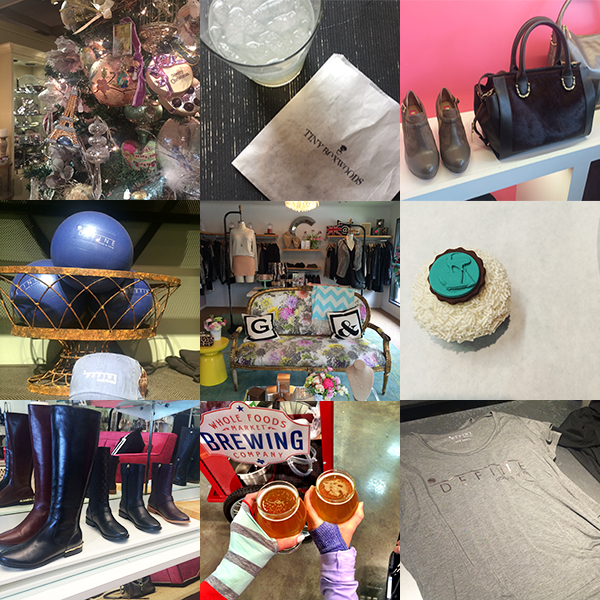 I wanted to share a few of those favorites and a couple new finds from my trip as I head back home to my men today! DEFINE // My very favorite workout is DEFINE Revolution, which I’ve written about before, but is a fun and challenging spinning class with great music. I’m also a fan of the barre workout, DEFINE Body, which is great for toning and stretching. I did three classes on this trip (including back to back classes last night) and, although I’m pretty sore, I’m hoping it will jump start a good workout routine for me when I get back home. Whole Foods // There is only one word you can use to really describe the new Houston Whole Foods: INCREDIBLE. I went with one of my girlfriends to pick up some snacks and we had a fun time sampling beers, cheeses and fruit. The service was unbelievable and on the weekends there is a beer tricycle that rides around the store with samples. If you’re in town, it’s well worth a visit – but make sure you book some time to get lost in there, it’s amazing! Bering’s Hardware & Gifts // Whether you’re looking for a gift, some gorgeous china or some knobs and lawn gear, you can get it at Bering’s. I got a special tour of the already holiday festive store on this trip and just continued to be impressed by the assortment of products and the impeccable taste of the Bering’s buyers. Some favorites: the chocolate truffles and coffee shop, the cutest kids clothes, and some of the coolest party supplies (funky napkins and styrofoam cups with occasion-appropriate sayings and graphics, and so much stationery!). They also have the largest Big Green Egg smoker that I’ve ever seen! Tiny Boxwoods // A Houston classic. Tiny’s is the perfect spot for brunch or a girls lunch. It is such a cool space and I always love the menu. I had been looking forward to getting a mint lemonade and chocolate chip cookie, and I definitely got my fix! Elaine Turner // Sure, you can shop Elaine Turner online but if you’re in town it is worth it to make an in-person shopping trip to one of the stores. Rice Village was the first Elaine Turner store I ever went to and I still love stopping in. Right now you can find the BRAND NEW Elaine Turner apparel collection, the best boots and a few jewelry and apparel items from other local designers that you just won’t find online. Liberty Kitchen & Oysterette // This was a new one for me on this trip! There is a Liberty Kitchen & Oyster Bar in The Heights, that we used to go to pretty often but the new location is a little fancier with an equally delicious menu. There were oysters, pulled pork mac & cheese (!) and a Cinnamon Toast Crunch cake and everything we had was awesome. Cakewalk Style Shop // I’ve been fortunate to work with Cakewalk before but I hadn’t been to their new location until this trip. The new store, in River Oaks, is light, bright and completely beautiful (if you go now, you’ll see their unbelievably gorgeous Christmas decorations) and filled with great buys from DVF, Vince, Joie and Houston-based Presmer and Charmed Circle (one of the Cakewalk owners is the designer of Charmed Circle, as well). Crave Cupcakes // Crave makes my very VERY favorite cupcakes. Every flavor is delicious, there is always just the right amount of frosting and they’re so pretty. Being in town close to my birthday was a perfect excuse to make a couple of visits to the store. Also, they have great coffee. In the spring there is a Hill Country Pecan coffee that I tend to buy and ration until this time of year when the Holiday Spice coffee comes out (and I may have a few bags in my suitcase to take home with me! ).